What Kind of Engine Comes Standard in the Chevrolet Silverado 2500HD? In 2019, Chevrolet reentered the Mid-size pickup market with the Silverado 2500HD. Designed a bit smaller than the Super Truck platforms that Chevrolet had moved to, the Silverado 2500HD carries and tows a bit less weight, but not enough to matter to the small business or individual owner in Harlingen. 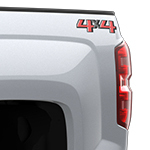 The power element in the Silverado 2500HD compares well with the larger truck models. The truck comes standard with a gas-fueled 6.0-Liter V8 motor with Variable Valve Timing that generates 360-horsepower and 380 pound-feet of torque. For the owner who wants more power, there is a diesel engine available—the Duramax 6.6-Liter Turbo Diesel V8 engine that generates 445-horsepower and 910 pound-feet of torque. The Chevrolet Silverado 2500HD is available in all trim levels at Gillman Chevrolet Harlingen where we specialize in the maintenance and service of Chevrolet trucks to keep them on the road and you in business.